The image above is a beautiful, peaceful glimpse into the history of one of Australia’s significant cultural sites. Sirius Cove, and the nearby Little Sirius Cove, are significant areas to Sydney’s history, and the greater history of Australia in general. Yet so many who visit the area have no idea of the extent of history contained in these beautiful foreshore areas. Before European colonisation of Australia, the protected and beautiful foreshore areas of Sirius Cove and Little Sirius Cove were the traditional lands of the Borogegal People. The most famous of these Borogegal People was Bungaree, who grew up in the traditional lands of his people and would have been very familiar with Sirius Cove. 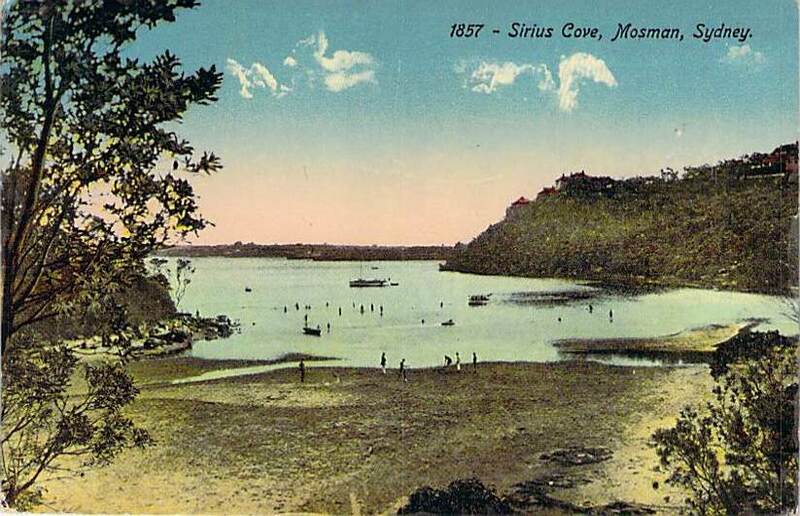 Yet it wasn’t long after European colonisation that European history began to be linked to the beautiful Sirius Cove. In fact, the name of the cove itself reflects its first role in European history. In 1789, just a year after European colonisation, HMS Sirius was careened at Sirius Cove. Sirius Cove was perfect for careening (or learning away barnacles etc from the ships hull) as it was a convenient cove, and relatively sheltered. The ship, which was the flagship of the First Fleet, was wrecked less than six months later. Of course, the most famous episode in the history of Sirius Cove is the artists camp which was established in 1890 at Little Sirius Cove. Come back next week to find out about the history of Curlew Camp. This entry was posted in Sydney Suburbs and tagged beaches, government, harbour, history, industry, military, postcard collection, sydney, sydney harbour, transport.